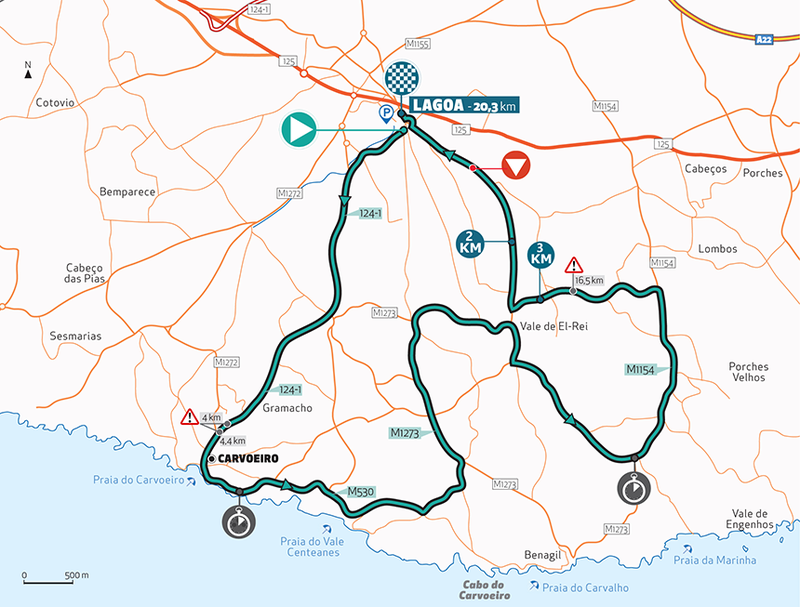 Hello and welcome to our live coverage of the 45th Volta ao Algarve. Today's stage 3 time trial runs 20.3km around Lagoa. Today's time trial is set to start in just over ten minutes. Here's the start order for the stage. Riders will be setting off at one-minute intervals until the top ten, when the riders will be separated by two minutes. Those at the sharp end of the GC will hit the road in around three hours' time. Today's stage is a little lumpy, but with the altitude never exceeding 100m above sea level, it's nothing to put off any pure time trialists in the peloton. It's an out-and-back course, from Lagoa to the coast and back. It looks like there's a headwind on the short coastal section, but nothing too strong. It's the same route as last year's time trial, which saw Geraint Thomas beat Victor Campenaerts by 11 seconds for the win. Stefan Küng took third, 19 seconds down. Here's the top ten from that day, and here's the stage report. And the first rider has set off. It's Jon irisarri (Caja Rural-Seguros RGA). The first several riders are out on course now. There's no television coverage for at least an hour and half though, so updates will be sporadic until then. Here are the top riders at the second time check at 13.6km. Cerny has set the fastest time so far. He was the fourth man off and his 25:39 leads all completed riders. Cerny is the fastest at all checkpoints at the moment, actually. Here's the top five at the finish. Mads Pedersen (Trek-Segafredo) has started well, with a time of 6:29 after 5.7km. That's the fastest so far. And Pedersen sets the new fastest time, 20 seconds faster than Cerny. He's top of the leaderboard at 25:09. Ryan Mullen (Trek-Segafredo) has gone through the first check at 5.7km with a time of 6:31. That's two seconds slower than Pedersen. We're an hour away from the top five riders starting their runs. Mullen is speeding up. He's fastest after 13.6km with a time of 17:49. Mullen goes fastest at the finish, becoming the first rider to break the 25-minute barrier. His time of 24:41 is 28 seconds faster than Pedersen. Television coverage has started, and Yves Lampaert (Deceuninck-Quick Step) looks to be going quickly. Loïc Vliegen (Wanty-Groupe Gobert) has just set off. He's 30th overall, so 29 more men to go. The top ten set off in two-minute intervals, remember. Stefan Küng (Groupama-FDJ) has just set off. He'll be aiming for the stage win today. Lampaert goes fastest at the 13.6km checkpoint with a time of 17:40. That's nine seconds up on Mullen. Tao Geoghegan Hart (Sky) sets the third-best time so far at 25:09. Lampaert edges out Mullen by three seconds to go fastest at the finish. 24:38 for him. Here's the top ten at the moment. And Arnaud Démare (Groupama-FDJ) immediately goes third-fastest with a time of 25:04. Amaro Antunes (CCC Team) heads out on course. He lies 8th at 1:42 and was on the attack multiple times in the finale yesterday. Küng goes fastest with a time of 24:33. It's only his third race day of the season. Five seconds faster than Lampaert. Søren Kragh Andersen (Team Sunweb) heads off. Just the top five to go now. Wout Poels (Sky) is out on course now. He's the favourite to take the race lead today. Tadej Pogačar (UAE Team Emirates) heads off in the yellow jersey. He's the last man out, obviously. Marc Hirschi (Team Sunweb) is the first of the top ten to finish. He sets a time of 25:39. Neilson Powless (Jumbo-Visma) finishes with a time of 25:17. Antunes with a time of 25:51. Kragh Andersen just misses out on Küng's time. His time of 24:35 is just two seconds short. 26:42 for João Rodrigues (W52-FC Porto) and 25:26 and provisional 15th for David de la Cruz (Sky). Kragh Andersen moves up past de la Cruz on GC now. Sam Oomen's (Team Sunweb) 25:53 means Kragh Andersen is up to fourth overall. 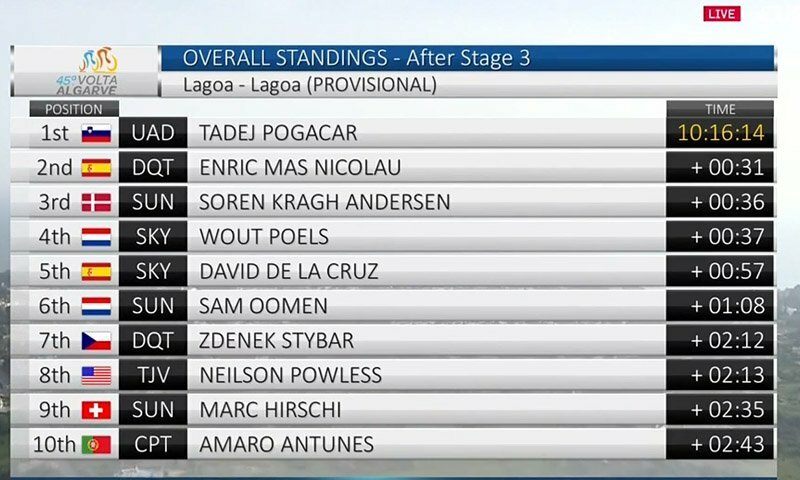 Mas, Poels and Pogačar remain out on course. Mas finishes just outside the top ten with a time of 25:18. Kragh Andersen is on the provisional podium now, with Mas five seconds back by my calculation. Poels is outside the top ten. He finishes with a time of 25:26, slower than Mas. An unexpectedly slow time trial from the Sky man. Pogačar had a great time trial! He finishes fifth and stays in yellow! 24:50 for the neo-pro. Stefan Küng is the stage winner. Mas finishes 12th and Poels 18th. Here's the provisional top ten on GC. It's another sprint stage tomorrow, so we're unlikely to see much GC movement. All eyes will be on Sunday's stage to Malhão, though Pogačar looks in a great position to retain his lead and win the overall. That's it for us today. Join us again tomorrow for live coverage of stage 4!